Defenders say PPACA helped cut the state's uninsured rate to 8.5 percent, from 14.3 percent. (Bloomberg) — Blair Wilson walked into a storefront at a Louisville mall. An hour later, she walked out with Medicaid coverage for herself and her father, who lost his insurance this year after two strokes. Kentucky’s Republican governor-elect, Matt Bevin, won this week promising to scrap the state’s Kynect insurance exchange created under the Patient Protection and Affordable Care Act (PPACA) — Obamacare — while repealing and replacing its Medicaid expansion. 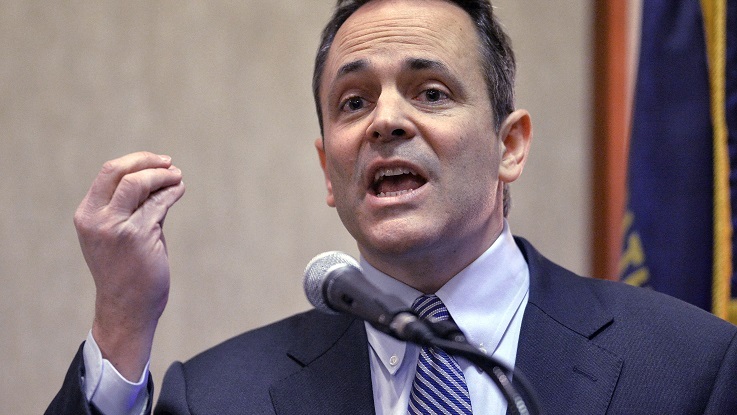 Yet Kynect, which Bevin has called part of a “financially ill-advised program,” in two years has enrolled 521,000 people in Medicaid or federally subsidized private plans. Joining is as easy as going to Mall St. Matthews for people such as Wilson, an 18-year-old nursing student who makes $300 a month, and it doesn’t cost tax dollars to run. Bevin’s rise to power will test the ability of Republican politicians to take away what in Kentucky is a popular program that has helped one in 10 residents to get insurance. All of the Republican presidential candidates have promised to repeal or replace PPACA. The House of Representatives has voted more than 50 times to scrap or restrict the program despite the certainty of the president’s vote. In order to make those gestures reality, the new governor will have to confront residents like Wilson. “I can go home and sleep and wake up in the morning and know that I don’t have to worry about not having insurance,” Wilson said in an interview at the Kynect store after enrolling. If Bevin ends Kynect as promised, “they’re going to have a lot of angry people on their hands,” she said. Kentucky under Democrat Steve Beshear was one of 12 states and the District of Columbia that created a state-based insurance exchange rather than allowing the federal government run it or partner with the state, according to the Kaiser Family Foundation. The commonwealth is also among 30 states that expanded Medicaid, the joint state-federal insurance plan for the poor. The governor-elect also said Medicaid expansion should be repealed, and he would seek a waiver of federal rules for eligibility and coverage with a “Kentucky-specific” version that’s more sustainable. It’s a talking point that may be difficult to accomplish, said Drew Altman, chief executive of the Kaiser Foundation, a Menlo Park, Calif., nonprofit that studies health care. “It’s easier to campaign on than it’s going to prove to be to change,” he said. Kynect is embedded in Kentucky, said Joel Ario, the first director of the U.S. Department of Health and Human Services (HHS) Office of Health Insurance Exchanges. Federal regulations for relinquishing control require 12 months’ notice and state participation in a transition plan, Ario said. Also, he said, it’s inconsistent for Bevin to demand more control over Medicaid expansion while relinquishing the state exchange that provides coverage. “That doesn’t fit together very well,” Ario said. Bevin spokeswoman Jessica Ditto said the federal exchange can operate more efficiently than Kynect and avoid duplication, while also ensuring that the federal government covers cost overruns. “While Governor-elect Bevin will look at the data in conducting a cost-benefit analysis, all objective indicators point to the federal exchange being a better deal for Kentucky,” Ditto said in an e-mail. Still, while some voters may oppose PPACA, many residents see Kynect as a state initiative they like, said Glen Mays, a professor at the University of Kentucky College of Public Health in Lexington. There are eight stations for agents to meet clients, with a Kynect logo on the floor and drawings on the walls of people in different walks of life. There’s a mock balloon gondola with a small picnic table and crayons for children and even a computer station with Kynect information and 10 power cords to charge cellphones and tablets. At its launch in 2013, the Kynect website worked, unlike the federal website and online state health exchanges that crashed. Governing magazine named executive director Carrie Banahan one of its nine public officials of the year for 2014. Kynect has an annual budget of about $28 million, all funded by a 1 percent assessment on health premiums. That charge would increase to 3.5 percent in a federal exchange, and dismantling Kynect would cost the commonwealth an estimated $23 million, said Audrey Tayse Haynes, head of Kentucky’s Health and Family Services department. In an interview at her Frankfort office, Haynes pointed to Census data showing Kentucky had the largest drop in uninsured residents of any U.S. state last year, a decline to 8.5 percent from 14.3 percent in 2013. Beshear, the outgoing governor, created the Kentucky exchange and expanded Medicaid using executive action over the objections of legislative Republicans. He justified the moves based on the 640,000 uninsured residents and dismal rankings for smoking, obesity, cancer deaths and heart disease. John Thompson, a retired dentist from Lexington who has served on the advisory board for the Kentucky exchange since its inception, wonders whether Bevin will actually abolish Kynect once he confronts the details. “He could not have done what he did in wealth management without being analytical,” Thompson said. “I just don’t think you can dismantle that and expect a good result in health care.